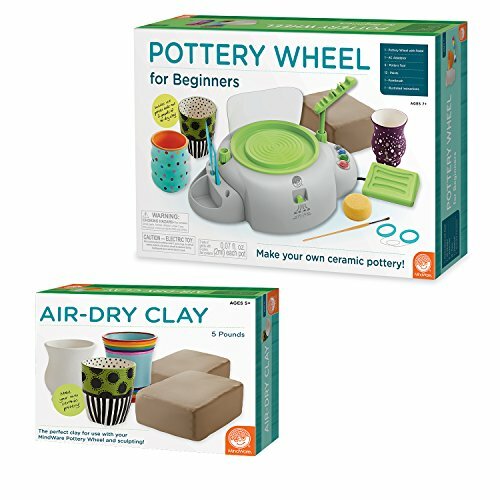 MindWare's Pottery Wheel for Beginners is a top-quality foot pedal-operated, dual-directional pottery wheel that is designed to help teach the basics of pottery and ceramics. With a safety stop feature built in to prevent the motor from overheating, this is the strongest and most durable pottery wheel available for children. On top of its high quality, this pottery wheel from MindWare can become a huge benefit for many children. The ability to learn pottery and ceramics at a young age could incredibly develop a love for a wonderful craft and art form that could last lifetime. This kit also comes with 12 paints and a paintbrush, allowing children to fully design their creations and spark a love for painting.